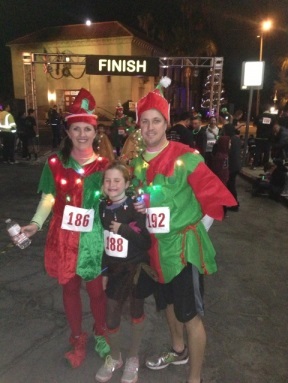 The Redlands Chamber Night Light Run event is on the way…. Saturday, December 27, 2014. Sponsored by Barich and Associates, Beaver Medical Clinic, Juice it Up, Arthur Murray Dance Studio, and Visiting Angels, the one of a kind night time running experience is coming back to downtown Redlands. 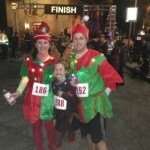 Last year the inaugural event saw close to 600 runners decked out in “glowtacular” duds chasing the lights in Redlands. It’s not exactly a run for your life, must beat your last 5K time event but it is about enjoying the lights, and the glow of the course along with your friends and family. In the dead heat of summer people are already making plans to hit the streets, lit up like holiday lights and wind their way through the brand new course. Runners, walkers, meanderers and roamers can register as individuals or sign up as part of a team; teams are made up of four or more. Glow gear is the order of the night and “athletes” are encouraged to come decked out in their finest neon attire. Registered runners will receive an official coveted neon bright T-shirt, glow accessories as well as a race bib. Participants don’t need to be in the best shape of their lives as the Night Light Run. There are plenty of other great 5Ks out there to test speed and performance. This event is all fun, friends and lights. Entrants can run, walk, crawl, skip, or amble back to the fabulous finish line where there will an amazing light and sound show waiting! Early registration will be discounted for those that are eager to be first in line at the start, check the website at www.redlandschambernightlightrun.com for electrifying details.